Change is a part of life and is as inevitable as the progression of one season to the next. Even after acknowledging that change will come, sometimes it begins before we expect it. 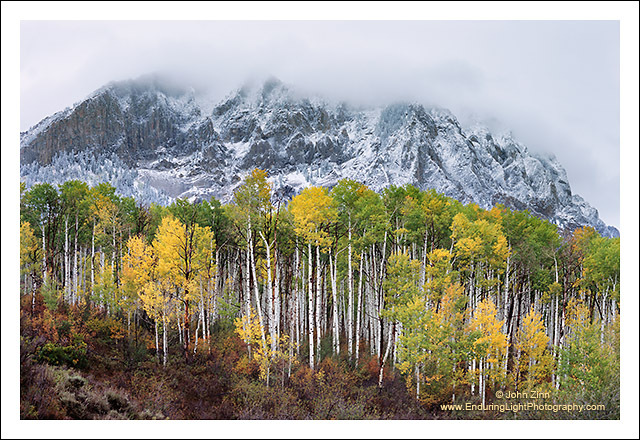 Though the transition of autumn had only just begun to change the aspens to gold, an early and surprisingly heavy snowstorm brought a prelude to winter, accenting the dramaticly sculpted face of Marcellina Mountain and concealing its summit behind some low hanging clouds.